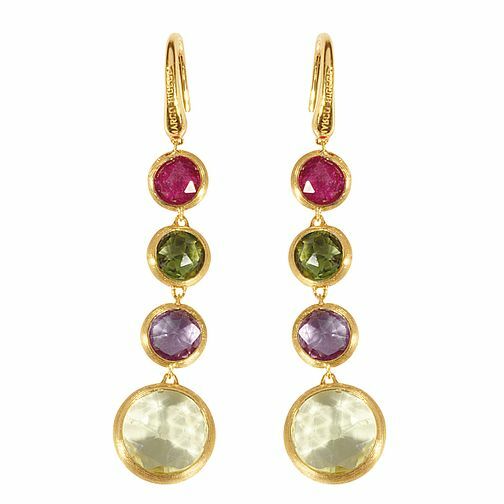 Marco Bicego 18ct yellow gold Jaipur mix drop earrings, featuring four circular drops each set with a different coloured stone. The Jaipur collection features hand chiseled 18ct gold delicate pieces of jewellery. Marco Bicego 18ct yellow gold multi stone earrings is rated 5.0 out of 5 by 1. Rated 5 out of 5 by Anonymous from Stunning earrings These are absolutely beautiful earrings which have been cleverly designed to work equally well with either a formal evening dress or t-shirt and jeans. I thought they might be too long (because I have quite a short neck) but they look fabulous and I am delighted with my purchase.